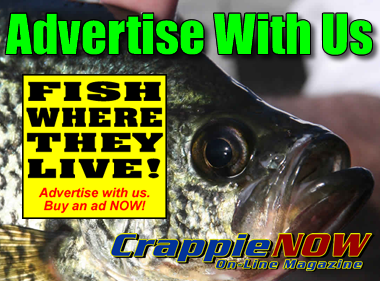 Crappie often move from shallow spawning areas out to flats and along mid-depth channels for their post-spawn pattern. When the fish suspend and chase shad it’s a great time to use trolling tactics to catch them. One tactic gaining popularity for crappie fishing is planer board longlining. 01- Trolling shallow flats can produce good crappie. A planer board allows a fisherman to hit shallow water without running over the fish with the boat. This article features going after suspended fish with planer boards so starting out by rigging right is important. The first piece of equipment is electronics. No surprise here because electronics can be an important tool for reducing search time. Ability to quickly learn fish depths, find schools of shad and the fish themselves, and time reduce wasted trolling unproductive water all lead to more caught fish. An autopilot-style trolling motor is important so the boat will maintain a set course even when a fisherman get busy catching fish or handling boards. Loss of boat control for several seconds can lead to disastrous tangles. Some fishermen use a kicker motor or the big motor with a trolling plate giving all-day use without worry about batteries going down. The disadvantage of an outboard is added noise. Heavy-duty trolling racks, strong poles, and planer boards complete the set-up and will be discussed more in detail. Buying everything from scratch can be expensive. We will assume you’re using your current electronics and trolling motor. A very basic/econo four pole setup will start at $600 and include a set of poles, line-counter reels, a rack/holder setup, planer boards and a few crankbaits. An eight pole setup with quality products will likely be $1800-$2400. Any equipment already in use and that can double-duty for planer boarding will quickly reduce the costs. “Trolling planer boards is basically longlining on steroids,” says Dan Dannenmueller. 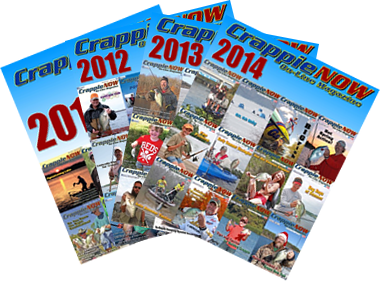 He is CrappieNow’s publisher and a regular on the Crappie Masters National Tournament Trail. He and partner Garrett Steele have been experimenting with planer boards for a couple of years and plan to be using them a lot this year. Dannenmueller’s trolling setup with Driftmaster rack/holders, BnM Silver Cat Poles and Off-Shore Tackle Planer boards. Note that fishing with boards is not without disadvantages. It takes practice and work to put boards on, put them out and remove them when retrieving a fish. They can be a pain. Also, running the boat and handling them after a fish hits requires knowing what to do. Turning requires a lot of room making sure there is not slack in any of the lines. 03- A planer board showing the clips for the board and flag. High-Vis line helps keep track of line even at long distances from the boat. The team says rigging a board and getting it out the side of the boat is easier to do than explain. A newcomer can check out Youtube videos to see how the line is connected to the boards. In the spring, the team focuses a lot on large flats between spawning areas and main channels. Fish get in the flats and suspend. 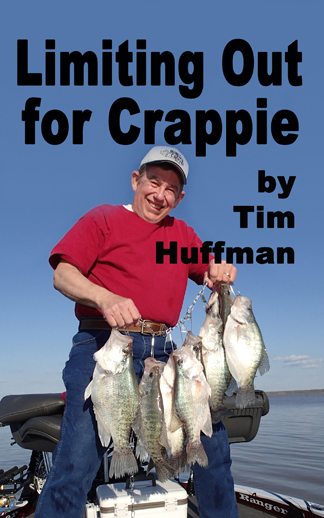 Schools of shad are the main food source and since the baitfish roams around so do the crappie. 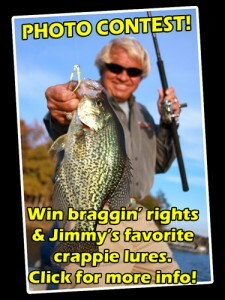 Trolling allows a fisherman to go to the fish and the boards are great for catching active or spooky crappie. Getting any bait to the strike zone and keeping it there is critical no matter which bait is being used. A Tadpole is a diving weight that gets a bait down and keeps it down. With a Tadpole, a bait can be set to 10 feet by using 12 feet of line under the planer board, where without a Tadpole, 50 or 60 feet might be required. Therefore, depth can be set more accurately especially when speeds change a lot. The team works the area when fish are found. Additional trolling runs will continue in the same path if necessary. However, once the right depth and general area is found, the team usually find fish scattered and they are not restricted to one specific spot. As the water warms fish may move to deeper flats and along deeper channels. A percentage of crappie will get tight to cover but many will suspend up over cover, a drop or other structure/cover. Move out to deeper water until the right areas are found where crappie are suspended and trolling runs can be made. A new wildcard bait the team uses is the Johnson ThinFisher. The blade bait has been extremely successful drawing bites when the jigs and crankbaits wouldn’t. The team says trolling boards are open water tools. You can’t be in stumps because a hang-up includes breaking off, loosing a bait and Tadpole, reeling all poles in and going to get the board. It’s not practical. He says it’s versatile because either crankbaits or jigs can be used. They can also be used in combinations.